JAM Productions had the worst of luck. When Apogee Software published their game Blake Stone: Aliens of Gold in 1994, Doom appeared on the shelves just seven days later, ready to dominate the gaming world with its brilliance. Despite having some interesting features that Doom lacked, it ran on a not-so-powerful, tweaked Wolfenstein 3D engine. To this day, it lacks the replay value or entertaining gameplay that id Software’s killer game had. In the distant future, the British secret agent Blake Stone is given the task to kill Dr. Goldfire, a dangerously intelligent scientist with plans to conquer Earth with his army of loyal troopers and mutants. Agent Stone must shut down six bases that belong to Dr. Goldfire’s company, S.T.A.R, destroying any foe in his path. It’s the typical cliché involving a smart guy gone mad with lots of baddies and money under his wing, wanting to take over the world. Yawn. Infectious tunes and action-packed songs are not found in this game’s soundtrack. Usually, a small set of notes are repeated over and over on each level, which makes things feel too mellow and relaxed, given the situation. They are mostly forgettable tunes, with the exception of the main menu theme, which is a fun little ditty that is good to whilste to. The sounds used in the game are a bit low in quality, but they get the job done. Although, it can be a bit of a pain when guards cry “MEDIC!” on death almost all the time. Goldfire must have cut the field medics from the budget, that cheapskate. If you’re no stranger to Wolfenstein 3D, then you’re in luck. Levels are labyrinths of various sizes and shapes that remain on a single floor, so that means no stairs, windows, pools, or other things that Doom pulled off. 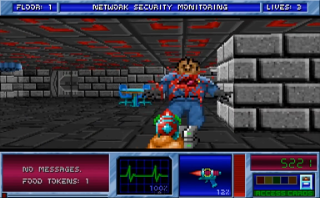 To exit each level, Blake must stumble through the various doors and gun down the baddies until he finds a red key card, which will unlock the next floor in the lift that he starts in on each level. Each chapter ends with a mutant boss, but Goldfire will occasionally appear on levels to take pot-shots anyway, just to disappear when taking damage. With eleven levels (two secret) per five chapters, it certainly does not lack in quantity, but does so in quality. It’s just a selection of big mazes. Whilst a map is available, relying on it is a pain since it will pause the game every time it is peeked at. 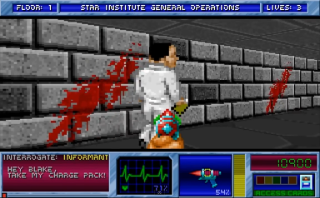 The weapons and enemies are nothing special, and act similarly to those in Wolfenstein 3D. When the baddies are shot, they do not flinch. This means they can drain health pretty quickly on the higher difficulties, and even get health boosts if you consider yourself worthy of making the game tougher. Although, an interesting feature is that Blake can talk to scientists to find whether they are bad guys, whom of which will engage in combat, or informants in disguise with information to share (from generic filler to hints about secret weapons in the area) and the occasional bit of supplies. Other interesting bits include electric barriers that can be flicked on and off by a switch, coin -operated vending machines for extra health, computers that remind players how many food tokens they have, a scanner on the heads-up display that shows who is attacking, and more. These are clever additions, yet it is heavily burdened by its previously-mentioned engine. Besides, it still includes lives and a point system, where big scores give health and lives. No pun intended, but, what’s the point? Why not infinite lives and offer full health if, say, 100 bags of gold or bars of the stuff are picked up? And how does Blake Stone haul off that much treasure, is the job itself paying minimum wage? In conclusion, Blake Stone: Aliens of Gold have a few interesting features that Doom lacked, but its dated engine, uninteresting levels and other nit-picky things like the bullet-sponge enemies makes this one hard to recommend. Not much gold here, just a lot of brass.